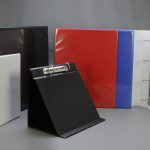 Many of the folders we produce are designed to display our customers valued products. To enable these expensive items to arrive safely within their display medium we can supply die cut foam inserts for insertion of their products. These foam inserts are made from high density polyurethane foam, to give rigidity to the structure as well as the softness needed for those potentially delicate items. Foam inserts are also incredibly light, so they keep the cost of transportation to a minimum, therefore reducing the items carbon footprint. Available in a range of thicknesses and colours, foam inserts for display purposes can be the perfect material, not only giving protection but allowing intricate and multiple sized items to be displayed within a single foam panel. A range of thicknesses are stocked which would suit the majority of applications but being as versatile as it is the foam can be duplexed together to allow for those extra depth non standard items. Easily adhered to the majority of our stock materials by means of a high tack adhesive backing, the foam inserts for display purposes are an ideal addition to any folder, when you need to ensure the product gives that initial wow factor, whilst still arriving in perfect condition. Foam inserts are also used in many paper over board display boxes produced by us. Designed to suit the size and depth of the box, it can be made to hold a single item or be laser cut to suit multiple items, i.e single bottles of perfume to complete ranges of pens. Kiss cutting is also a common production method where the foam is only cut to certain and varied depths across the foam panel, allowing shallower items to be displayed as predominantly as their larger bulkier counterparts. Thumb cuts can also be added to your foam insert which aids removal of the displayed product.